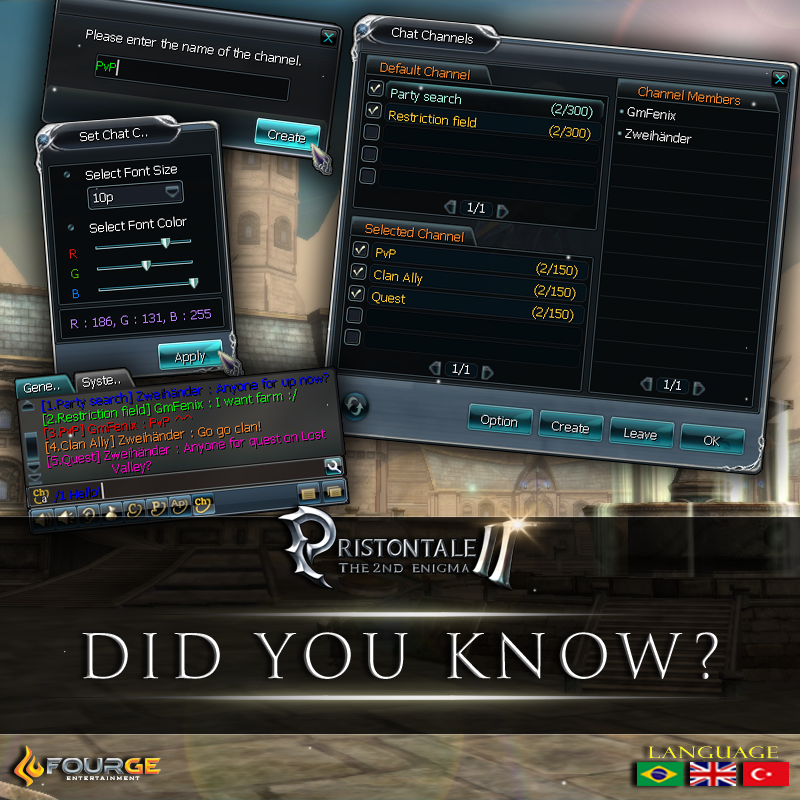 You can create specific channels to talk to other players. By typing "B", you access an option where you can enter two pre-defined channels by selecting it and clicking "Attend", or any other already created. To create is also very easy, just click on "Create", choose a name and you're done! To talk on the channels, simply type "/1" or "/2" or any other channel number available and after a space type what you want. You can still set the color and font size of each channel by selecting it and clicking "Option". To exit is very simple too, just select the channel and click "Leave." This makes it much easier to search for groups for Dungeons, Farm, Hunt, Quests, PvP or even talk to allied clans. É possível criar canais específicos para conversar com outros jogadores. Teclando "B", você acessa uma opção onde é possível entrar em dois canais já pré definidos selecionando-o e clicando em "Comparecer", ou em qualquer outro já criado. Para criar também é muito fácil, basta clicar em "Criar", escolher um nome e pronto! Para falar nos canais, basta digitar "/1" ou "/2" ou qualquer outro número de canal disponível e depois de um espaço digitar o que desejar. Ainda é possível definir as cores e tamanho da fonte de cada canal, selecionado-o e clicando em "Opções". Para sair é bem simples também, basta selecionar o canal e clicar em "Sair". Assim fica bem mais fácil procurar grupos para Dungeons, farm, hunt, Quests, PvP ou até falar com clãs aliados.